Sometimes the best way to tell where you stand with someone is the quality of the gift they give. Is is thoughtful? Is it well-chosen? For the holiday, this pile of garbage got you a clip show. They bustle about to create a signal fire, and, as they are expecting to be rescued any minute, begin reminiscing about their first day on the island. Cue the flashbacks. To be fair, my internet research indicates that some of this was footage from the pilot and some was reshot because the cast changed after the initial pilot was filmed. Apparently the pilot was never aired during the original run of the series, though, so it wasn't actually repeat footage for the audience. Each of the flashback vignettes starts with an idea - fix the radio, get up high and look for others, recover and repair the radio (again), etc. - which is undermined and foiled by Gilligan's obliviousness. He flings the radio into the ocean. He mistakes the boat they arrived on for a boat they can leave on. Once they find the radio transmitter (in a fish) and get it working, he drops a bunch of wood on it, breaking it again. I just...I know it's a stupid sitcom, but...it takes willful malevolence to be that clueless. By the end of the episode, I hated all these characters and would not be sad if they died of exposure. So yes, Santa leaves them there to rot. 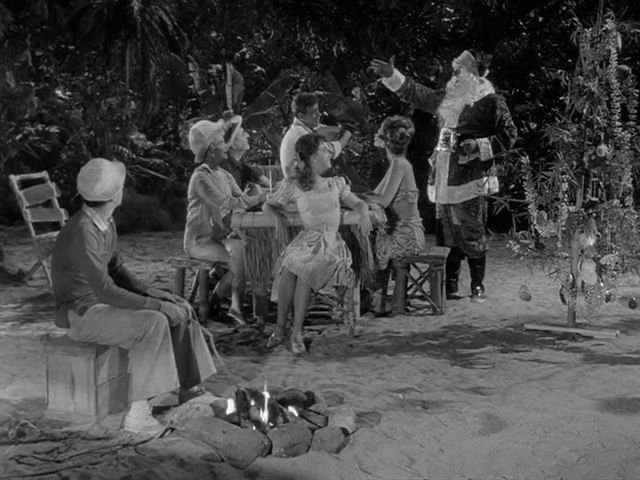 He's got the right idea; if you've never seen GIlligan's Island, just keep it that way.